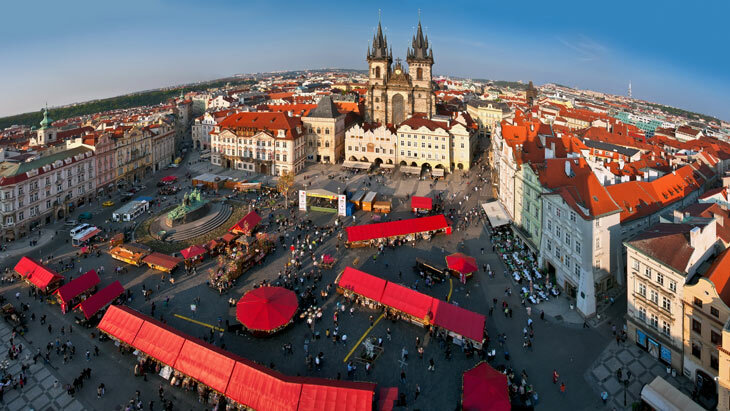 The Prague Easter Markets are an essential part of the spring Prague, which bring bright colored handcrafted goods, all manner of food and drunk and wonderful old customs to Prague waking up after the cold winter. The Easter markets run daily from 16th March to 7th April at the Old Town Square and Wenceslas Square. There are also smaller Easter markets at Náměstí Republiky and Náměstí Míru. The lined up rows of wooden huts display a wide range of handcrafted products, such as genuine glassware, jewelry, scented candles, wooden toys, embroidered cloth, and puppets and dolls. However, the most traditional feature of Czech Easter are the brightly coloured, hand-painted Easter eggs and the typical braided whip made from pussywhillow twigs. The former is called kraslice, which Czech ladies dressed in traditional costume can personalise for visitors, by painting on a name or a special message. The latter is thought to bring health and youth to anyone who is whipped with them and has been used by boys who go caroling on Easter Monday and symbolically whip girls on the legs. Apart from shopping you should also sample the traditional Czech foods, such as pastries, sausages and roasted ham. For kids there is a children’s cabin at the Old Town Square. Inside, workshops are held where children can enjoy the spring and Easter activities: making Easter chicks, painting eggs and flower pots. There is also a farmyard pen, where kids can stroke sheep, goats, rabbit and a donkey.